It looks like a kid-sized funhouse concoction, but this is a sandwich for adults. Healthy adults. Take the earthy flavor of beets and combine it with the creamy texture of goat cheese to make a spread that you’ll never speak of for fear of making that dream become too real. Sure, it’s scary when your dreams come closer, but you should embrace that fear like the sharp and bitter flavor of spinach will embrace your taste buds with leafy pride. Put all of this on traditional white bread, to bring some level of comfort and security to a stressful situation. But don’t forget: fear not. 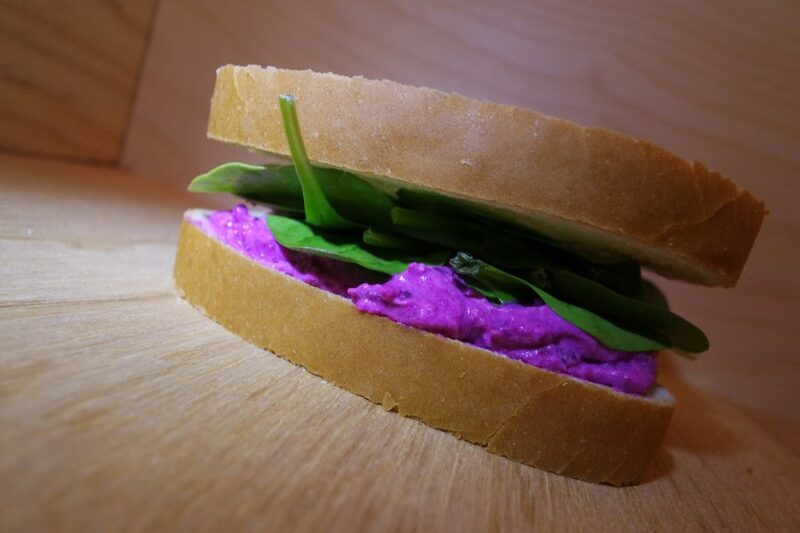 You got this weirdo-looking sandwich, and you’ll own those dreams. Bite in.